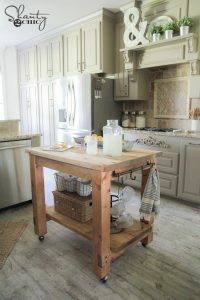 It may sound boring but there are plenty of great designs and uses for trolleys around the home. 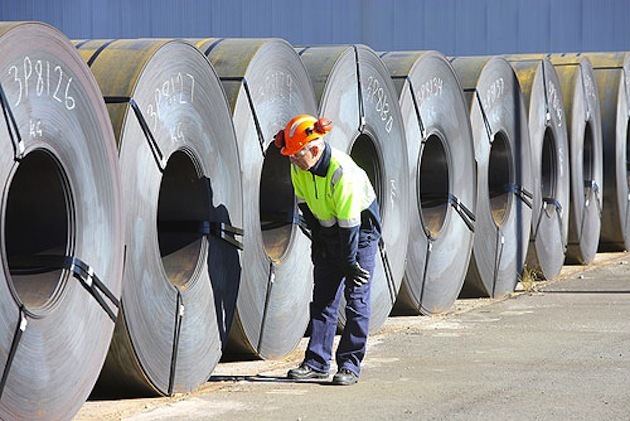 They can make life a lot easier and they are super easy and inexpensive to build. If you love to entertain friends in the backyard, front yard, your patio, around the BBQ and pretty much all over the house you may want to invest in building yourself ‘The Leaner”. This trolley can be wheeled around anywhere you wish and is the perfect height for leaning, sitting around and chatting. 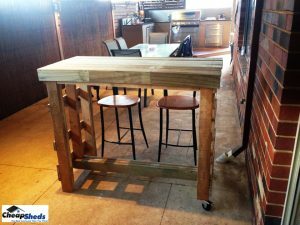 Aussie creator, Joel Murphy came up with this DIY Trolley on his own and built it from simple timber from the hardware store and some simple parts. If you love to BBQ during hot weekends then why not consider a BBQ trolley. It would save you numerous trips back to the kitchen to get all your supplies for the cook-off plus you can pile up the plates and cutlery onto it too- so you are all set to feast. Neat idea: Why not add a section for a small esky to keep your drinks cold. 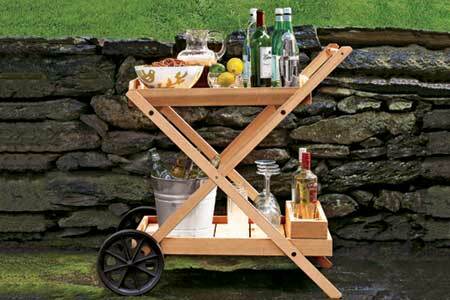 Got a BBQ trolley or perhaps you are one of those lucky people who have everything on hand near the BBQ already? Well, maybe you would like to consider a Drink cart instead. It can be lightweight so you can roll it to where ever the party has moved to in your home. You can use the provided design below which includes bottle holders but you can go a step further and add your own features such as a wine bucket or esky hole or even make slots to hang or hold your clean glasses in! The possibilities with this one are endless. Neat idea: Don’t forget a built-in bottle opener! Maybe BBQs are not your thing or you just prefer entertaining inside. In that case, you could extend your kitchen bench by adding a kitchen trolley or it doubles up as an island. This will give you more room while preparing food or room to serve your delicious dishes. And because it’s a trolley you can even wheel it to your dining area laden with yummy items instead of carrying one dish at a time or trays. 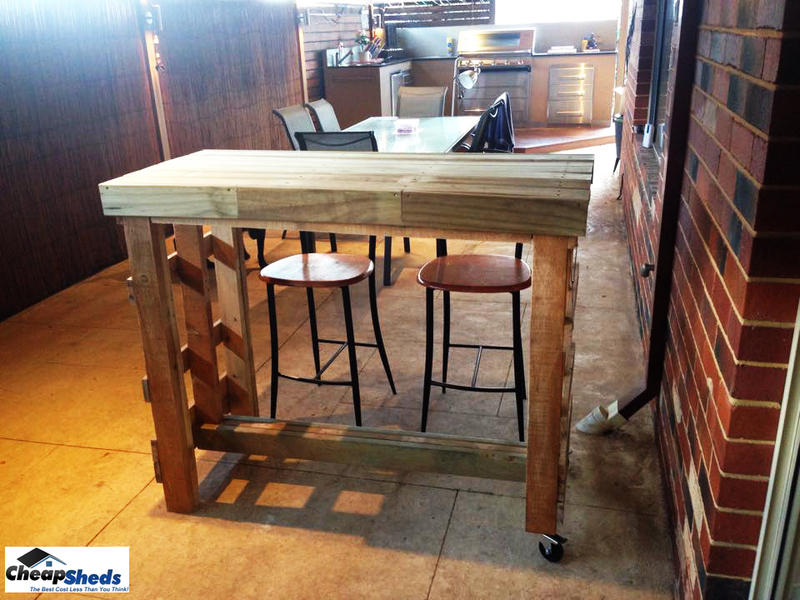 Neat tip: Keep your kitchen bench height in mind when building your trolley. It would be ideal to have it close to the same height. 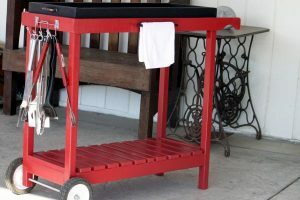 A tool trolley is a very popular item in a garage or workshop and if you don’t have one… make one. You will be so grateful. 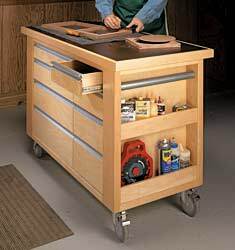 These neat trolleys will be home for your most common tools and you can wheel it around the garage or home when working on projects. It will keep your tools more organised and keep them all in one place while working. Neat tip: First assess how many tools you have and need room for so you build the right style and size for your needs. Neat idea: Consider adding drawers for those small bits and bobs like nails.